In a move that will transform Australia’s caravan and camping sector, Discovery Parks has acquired the Top Parks brand, creating Australia’s largest network of parks. Under an innovative licensing model, Top Parks member parks will remain independently owned but will form part of the growing Discovery Parks network. The combined group creates a network of more than 220 parks and a loyalty base of over 140,000 camping enthusiasts, making it the single largest group of caravan, holiday and resort parks in the country. Top Parks Chairman Richard Emerson said the agreement would position Top Parks members for strong future growth, with clear synergies between the groups around culture and customer experience. “It will create a leading market industry member group that can deliver great benefits both to the park owners and our customers,” Mr Emerson says. Under the agreement, both the Discovery Parks and Top Parks brands will be retained, allowing for differentiation between the company owned and licensed parks. “We’re committed to discovering what matters to our customers and providing it — in the holiday and travel-for-work markets,” Mr Wilckens says. Mr Wilckens says the deal will provide licensed parks with access to Discovery Parks’ greater purchasing power as Australia’s largest park owner-operator, as well as its digital marketing expertise. Top Parks and Discovery Parks members will have access to a new customer rewards program, G’Day Rewards, which is being launched today at the Adelaide Caravan and Camping Show —part of a suite of customer-orientated systems and technology. “You might not think about holiday parks as innovative digital service providers but that’s where Discovery Parks is heading. We are investing significantly to be able to provide a better customer experience. “Just as we are using digital technology to turn on the lights at home, do our shopping and manage our security, our holiday parks will be tapping into this technology to deliver a range of new and innovative services to customers in the near future,” he says. Mr Wilckens, who is also chair of the Caravan Industry Association of Australia, said the deal would make Adelaide the national hub for the caravan and camping industry, worth $19 billion to the national economy. Discovery has bucked the 5 per cent downturn in the national caravan and camping market in 20171, growing revenue by nearly 14 per cent year on year. The Adelaide office grew by 30 per cent last year, prompting a move to larger premises. The company has spent more than $11 million in key parks in South Australia and $30 million at parks nationally this financial year. “With the backing of our majority owners, Sunsuper, we are expecting to continue this strong growth into 2018 as we are able to use our customer data to innovate and continuously improve the customer experience,” Mr Wilckens says. South Australia’s Shadow Minister for Tourism, the Hon. David Ridgway and award-winning travel ambassador Andrew “Cosi” Costello will tie the ribbon on the deal at a celebratory Aussie morning tea at the Discovery Parks-Top Parks stand at the show. 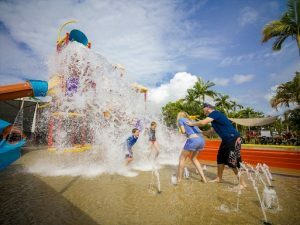 What: The launch of Australia’s largest holiday park network and G’day member rewards. Headquartered in Adelaide, South Australia, Discovery Parks is the largest owner and operator of lifestyle parks in Australia. Its parks are distributed across Australia’s outback, water front and national parks ranging from isolated campsites to 4.5-star family luxury.